AKIPRESS.COM - Kazakh national football team will begin its Euro 2020 qualifying campaign with home matches at Astana Arena against Scotland and Russia March 21 and March 24, Astana Times said referring to the draw results. The Union of European Football Associations (UEFA) Euro 2020 qualifying tournament will determine the 24 UEFA-member men’s national teams advancing to the finals. According to the new qualification system, 20 teams will progress to the finals via the traditional group method and the remaining places will be decided through the 2018-2019 UEFA Nations League. The qualifying draw was broadcast live to a global audience from Dublin’s Convention Centre Dec. 2, when Kazakhstan discovered its opponents. Fifty-five national teams were split into ten groups, with the country landing in Group I with Belgium, Cyprus, Russia, San Marino and Scotland. Qualifying games will take place from March-November, with the top two teams from each group progressing to the finals. Kazakhstan, ranked 120th, is coached by Stanimir Stoilov and features top players centre-half Yuriy Logvinenko, goalkeeper Dmytro Nepohodov and midfielder Georgy Zhukov. Following the first round, the team will again meet Russia (Sept. 9) and Scotland (Nov. 19) at the end of the campaign. Kazakhstan will also face Belgium on June 8 and Oct. 13, San Marino (June 11 and Nov. 16) and Cyprus (Sept. 6 and Oct. 10). Its toughest competition will be Belgium, which ranks first and is coached by Roberto Martinez. Top players feature winger Eden Hazard, midfielder Kevin De Bruyne and defender Dedryck Boyata. 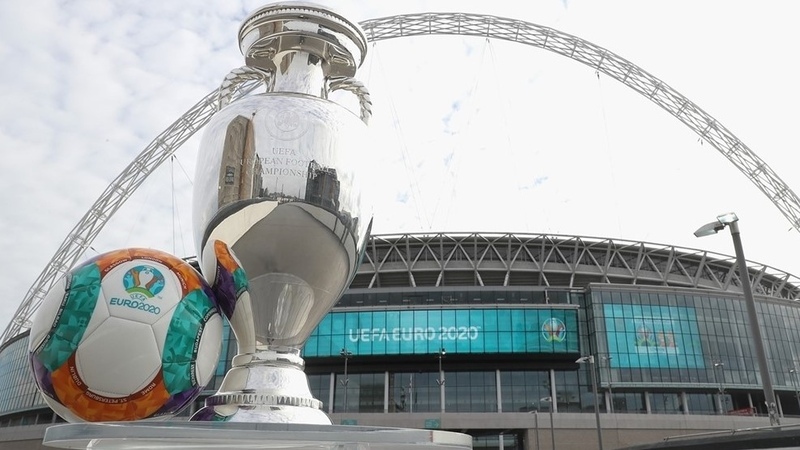 Euro 2020 will be hosted in 12 cities in a dozen European countries to mark the competition’s 60th anniversary. The UEFA Executive Committee decision to host the championship across the continent for the first time will alleviate investment costs for host cities and make celebrating the sport more inclusive. Euro 2020 venues include Amsterdam’s Johan Cruyff Arena, Baku’s Olympic Stadium, Bilbao’s San Mamés, Bucharest’s Arena Națională, Budapest’s Puskás Aréna, Copenhagen’s Parken Stadium, Dublin’s Aviva Stadium, Glasgow’s Hampden Park, London’s Wembley Stadium, Munich’s Allianz Arena, Rome’s Stadio Olimpico and Saint Petersburg’s Krestovsky Stadium. The final will be held at Wembley Stadium, known as “the home of football,” which last hosted the event in 1996.